Have you ever wondered why you are going through certain challenges? Have you ever wondered why you are having this life experiences? Feeling like you are failing miserably the one minute, overcoming miraculously the next and so on….one thing I know is this. We teach others what we need to learn, we inspire others when we need the same inspiration, it doesn’t matter that we haven’t overcome something yet, we think we need to be perfect before we can teach, inspire or guide someone else. When, in truth, we are a student and teacher at the same time. We inspire others by the way we deal with something, by how we receive and give, by how the words we speak and the love we give is given – always pure, always with the intention to love and not to judge. When it feels like life is hard, or you are facing certain choices or have a few WHY questions…remember to keep an open mind and ask your Highest Self to reveal to you the teaching, the insight, the essence of where you are now. Learn new ideas, from your Higher Self, Spirit Helpers and others. Speak to others, ask for help, join a community – this is where the teaching and learning lie. And in so doing, you can inspire and teach others, which ultimately is what our Soul is striving for. To serve. Yet, if we do not serve the Self, if we do not fill up our Love Bank, we cannot give such inspiration and wisdom to others. 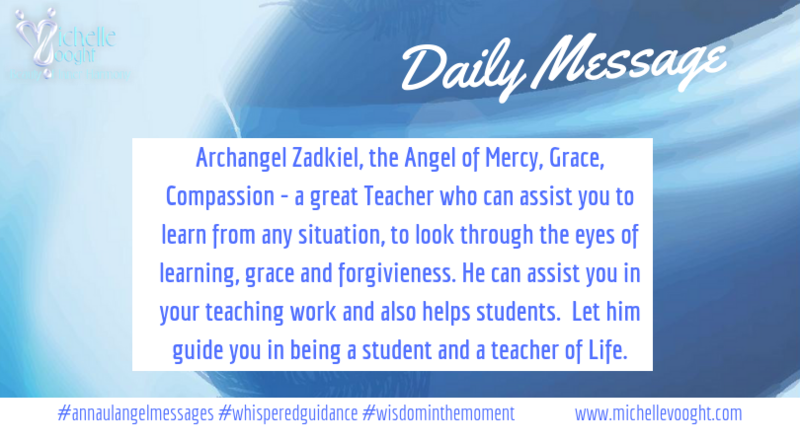 Archangel Zadkiel, the Angel of Mercy, Grace, Compassion – a great Teacher who can assist you to learn from any situation, to look through the eyes of learning, grace and forgivieness. He can assist you in your teaching work and also helps students. Let Him Guide you in being a student and a teacher of Life. Have a beautiful, soulful learning day!